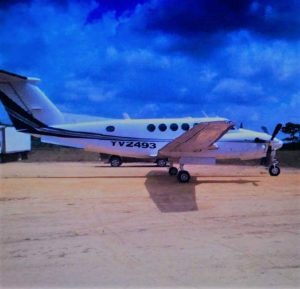 Six Venezuelans and a Guyanese pilot were Tuesday taken into custody in connection with an aircraft that authorities believed has fake registration marking. The plane that landed at the Cheddi Jagan International Airport with two Venezuelan pilots and four Venezuelan passengers. The two Venezuelan pilots and four passengers, two of whom are lawyers, arrived aboard the plane bearing registration YV-2493. Director-General of the Guyana Civil Aviation Authority Retired Lt.Col. Egbert Field told Demerara Waves Online News that steps were being taken to verify whether or not the registration was bogus. Police said the private chartered aircraft at the Cheddi Jagan International Airport at about 15:20hrs Monday afternoon.